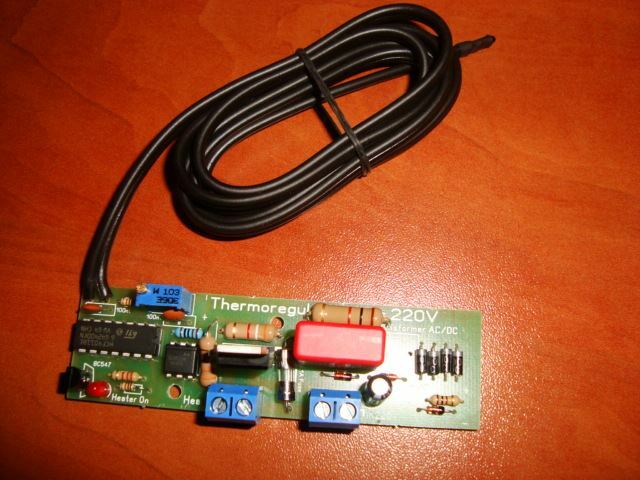 This electronic thermostat is very precisely and have electronic switching element. 5. 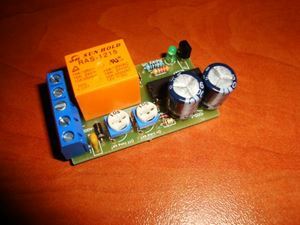 Heater voltage - 220-240V AC6. Plate dimensions - 9 x 2.6 x 2.7 cm.7. 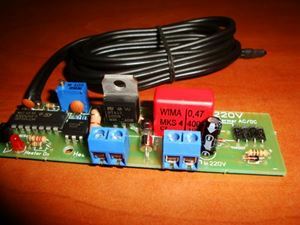 Device have one red led diode for indicating working heater. Temperature is adjusted with small insulate screwdriver. Please note that thermostat is not galvanic insulated from the mains power. I'ts strongly recommended to not touch it with hands when it is power on. 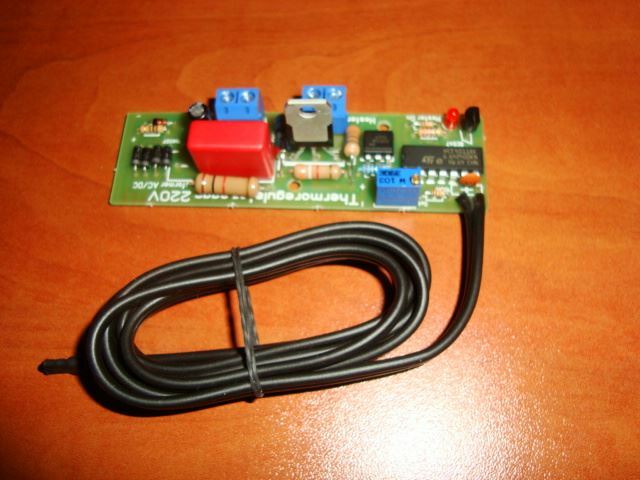 First need to be connected two terminals with label –“ heater” to heating system of your incubator – can be electrical bulbs for better result. Please be careful, not to reverse it – then thermostat will not work. 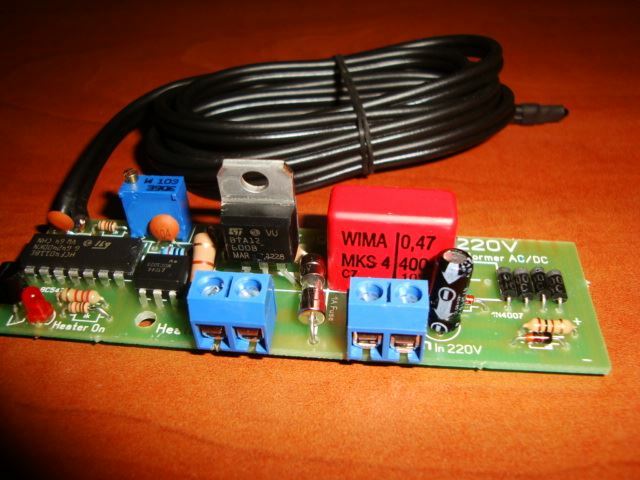 The heater and power supply need to be at same voltage! When you wire up the wires need to make good insulation to prevent short - circuit and damage to the thermostat. Place the probe over the grill for eggs. 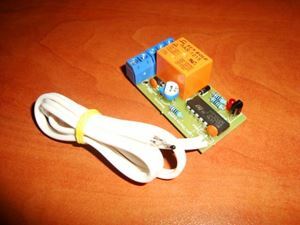 Connect the Fan to appropriate power supply – it need to work all the time. With this wiring of the thermostat is done. First you need to be sure that all is insulating good to prevent short circuit, or electric shock. Turn the knob at extreme right position - clockwise. Place the thermometer inside near the probe to monitoring temperature inside. The first setup need to be done without eggs!! Plug the plug to the main and rotate the blue trimmer counterclockwise until green diode light and heaters on. Please note that trimmer is without end and have 26 turnover. When you reach end you will hear “clic” noise. When you reach the require temperature for the eggs turn the trimmer clockwise precisely until you cut off the green diode and heaters. If this is first setup of the incubator – this need to be repeat until you heat the whole volume. Now all must be tested for 1-2 days, to be sure that all is fine, before you place the eggs for hatching.